If you’re one of the thousands of Kiwis who enjoys throwing in a line to catch a feed now and again, you’ve probably given little thought to what you might spend on your hobby. And the truth is, no one really knows how much recreational fishos contribute to the nation’s economy. But it’s numbers like that which help politicians make informed decisions and lead them to really listen to what the recreational sector has to say, when it comes time to make the rules. For example, the current high levels of commercial fishing can be strongly defended because their export returns to the economy can be easily quantified. That’s why a new campaign by LegaSea, the NZ Marine Research Foundation (NZMRF), the NZ Sport Fishing Council and Bluewater Marine Research is hoping to put a dollar value on recreational fishing and confirm it as a legitimate, valuable industry. LegaSea is leading the charge on this important project, titled What’s Fishing Worth? A recent similar study in Australia found recreational fishers contributed an astounding $2.56 billion to the nation’s economy. So the NZMRF has contracted an international firm of experts to compile a report on the value of recreational fishing to NZ’s economy. It is hoped this information could even lead to a shift in marine management at a government level – one which better reflects the needs of the ‘casual fishos’. However, LegaSea and the research team need your help to advocate on your behalf. The project is expected to cost around NZD 400,000 and the public is being asked to pitch in NZD 100,000 through a crowdfunding campaign. As of publication, both the study and the crowdfunding project were already underway. Stage three of the research will run until November, taking in a charter boat survey, developing spending profiles and applying regional economic models. Meanwhile, the campaign in givealittle.co.nz has attracted nearly NZD 37,000 from 566 donors – an impressive average of around NZD$65 each. As the NZMRF is a charity, you can also claim 33% of your donation back at tax time in New Zealand. 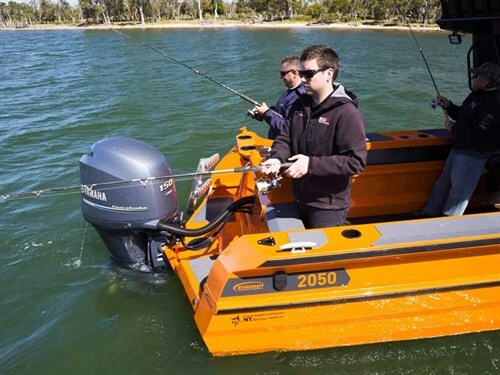 Check out the fishing gear and equipment used on the Stabicraft 1650 Fisher giveaway boat. A barra fishing trip to the Northern Territory could net you more than just the fish of a lifetime.